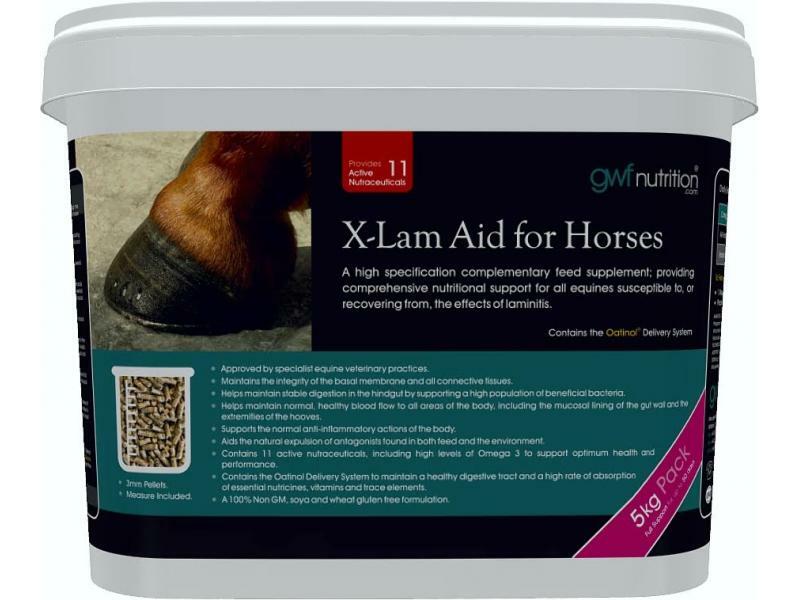 X-Lam Aid for Horses is a high specification complementary feed supplement for all horses and ponies, providing comprehensive nutritional support for equines susceptible to, or recovering from, the effects of laminitis. Has been approved by specialist equine veterinary practices. Helps maintain the integrity of the basal membrane and all connective tissues. Helps maintain stable digestion in the hindgut by supporting a high population of beneficial bacteria. Helps maintain normal, healthy blood flow to all areas of the body, including the mucosal lining of the gut wall and the extremities of the hooves. Supports the normal anti-inflammatory actions of the body. Aids the natural expulsion of antagonists found in both feed and the environment. Contains high levels of Omega 3 to support optimum health and performance. Contains 11 active nutraceuticals, including: collagen matrix, curcumin, hemp oil derived omega 3 fatty acids, microscopic toxin binder, natural buffering material, oligosaccharides, vitamin B complx and a blend of galactolipid emulsifiers, tocotrienol antioxidants, beta glucans and phospholipids. Is manufactured as very palatable and easily digested 2mm pellets; perfect for mixing with horses' normal feed. Collagen Matrix Collagen is the body's natural glue that is crucial for all connective tissue, including the base membrane of the hoof. Collagen is essential for the integrity of tendons and ligaments and particularly the anchoring points where they are attached to structures like bones and hooves. Natural Buffer Material Natural buffering material helps support stable, beneficial digestion in the hindgut by providing a neutral environment for friendly bacteria that can be susceptible to acidic conditions. The pH in the digestive tract can be lowered by sugar overload, so restricting grass and providing natural acid buffering, aids micro flora and gut wall integrity. MT.X+ Microscopic Binder MT.X+ is microscopic absorbent compounds that aid the natural expulsion of antagonists, found in feed and the environment. Vitamin B Complex B vitamins are essential for maintaining normal, healthy blood flow to all areas of the body, including the mucosal lining of the gut wall and the extremities of the hooves. Blood flow is essential for the supply of active ingredients to maintain normal gut barrier defences and hoof integrity. Oligosaccharides Oligosaccharides from yeast cell wall and concentrated oat bran sources that help support natural expulsion of antagonists in the digestive tract and maintain a high level of natural immunity. There are currently no questions for Gwf Nutrition X-Lam Aid Pellets for Horses - be the first to ask one!